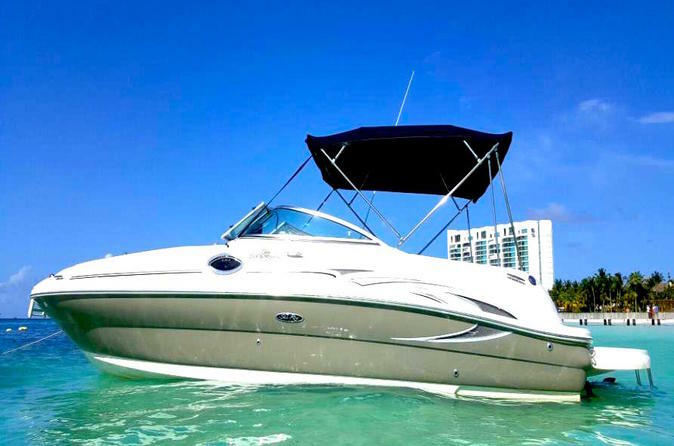 Enjoy the freedom explore, swim, and snorkel the waters around Cancun as you like with this 5-hour private boat charter. Accommodating eight passengers, the 24-foot boat comes with a captain and skipper, who take you wherever your group of family and friends wants to go. Snacks and some drinks are available on board, but feel free to bring your food and beverages of choice — this day is all about your preferences. Even better: hotel pickup and drop-off from Playa del Carmen is included, making the experience even more hassle-free. Avoid the crowds and charter your own private boat for a 5-hour tour of the waters around Cancun. After pickup from your Playa del Carmen hotel, board a 24-foot (7-meter) boat, where your captain and skipper greet you and your group (up to eight passengers). Enjoy the flexibility of this outing: swim and snorkel with the provided gear, or just kick back and relax on deck. The crew knows where the most exclusive beaches, reefs, and points of interest are; you can decide on your itinerary as the journey unfolds. Some snacks and beverages are provided, but you are welcome to bring additional food and alcoholic beverages on board. Let loose as you feel the sun on your skin and the wind in your hair.